I keep meaning to do this too. I highly recommend them. Keep them in the fridge all the time. Add them to salads, put them on sandwiches, use them on a relish tray. The old tree only bears about once every three years now. This year, it was loaded. 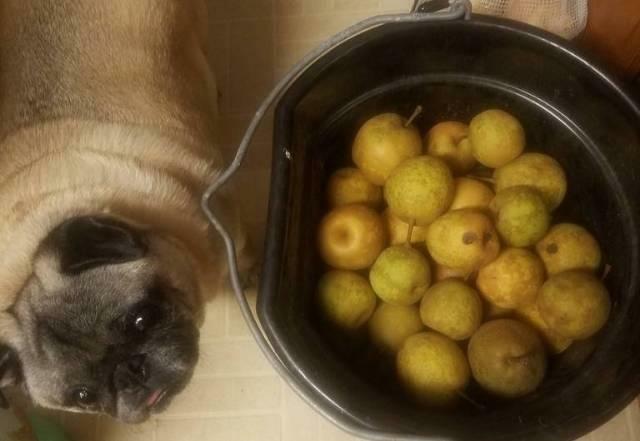 I brought home about 30 pounds of pears. They kind of look like mine, which I have been told are Chinese Tsu Li pears. Mine have a good and sweet flavor, never really ripen, but stay grainy and crisp and seem to need to be cooked. I will have to try making those preserves. I brined some more pork tongues for 2 weeks and cooked them in the Ipot and froze them just before we left for vacation. I remembered them today, for some reason, while I was at Aldi, so I added rye bread and Swiss cheese to my list. I took them out of the freezer and miked them long enough to separate a few to thaw on the counter while I worked in the garden and made a corned pork tongue Reuben sandwich for lunch. They are so very good and so very cheap, I just think they will suddenly become the rage any day now and skyrocket in price. Yup. That is the one I used. Let us know if you make the pickle and what you think of it. Made a batch, tasted one after 3 hours, definitely needs more time. I didn’t take the time to destring the celery (too lazy) and I am doing the marination in a ziplock bag where I just pressed out as much air as possible, so it may take longer to infuse. Does taste good in the interim. Did mine in a re-sealable bag but today I bought more celery and I intend to repeat the recipe using the FoodSaver. Finished up my first batch as a snack this afternoon and then did a whole bunch of celery and this time I vacuum sealed using the FoodSaver. The ones I finished seemed crisper, a little hotter from the chilli and a little more tasty so they do seem to improve with age. Ate several pieces today, that would be 27 hours marinating, markedly better. I didn’t have any chilis, so mine are just salty (in a good way). They would make a nice side dish with a few drops of toasted sesame oil and toasted sesame seeds. Next time I may chop into slices rather than sticks, better for topping rice. Once again I forgot the damn chilis. But when I open the bag tomorrow I will add some Korean pepper threads as I did last time and I’m sure they will be fine. Nice thought on slicing them so you could add them to rice. It’s not often that I find a recipe that is so simple and yet so good. I don't know why I'm even commenting, since I don't care for celery. But would gochujang paste be good in this? It also strikes me that it would be good to do this with peeled, hardboiled eggs. Maybe not pull a very hard vacuum, to avoid deforming the eggs? Thoughts? That one really intrigues me. May have to experiment. Even if you don’t care for celery you should try this. Trust me. I am guessing gochujang would work but so would almost any dried chilli or even dried chilli flakes. The paste seems messy way to do it to me. I have a safety issue (which is absolutely personal) about pickled eggs. But if you were going to use eggs then I think a Ziploc bag using the displacement of water method would be better than attempting a vacuum. Your mileage may vary. 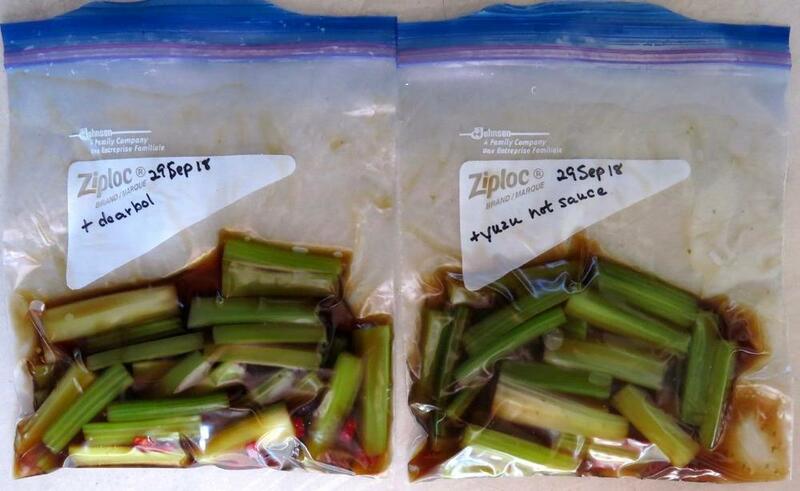 The bag on the right has fish sauce, soy sauce, Trader Joe's yuzu hot sauce and yuzu juice (bottled). The yuzu hot sauce has a green chile flavor so I'm interested in seeing how that will compare to the dried red de arbol chile. Next grocery trip will include rice vinegar and lemons so I can set up some with the original recipe as written. Pickling up a few pounds of celery is on my list for the next week or two, so I'm glad it came up here. I'll give it a try. Geez, I hope celery doesn’t become an endangered species. Oh my GOODNESS! DELICIOUS!! I have been pickling celery up and down and all around -- excellent snack, and in season over thisaway right now -- and I'm worried that the other recipes are going to be left in the dust. One has some anchovies seasoning the brine (From Kevin West, "Saving the Season"), so maybe it will have some traction, but the other one is a basic ferment with mint. It's good to have options, but . . . man are these ones from Anna N good. Thanks so much for passing the recipe along! 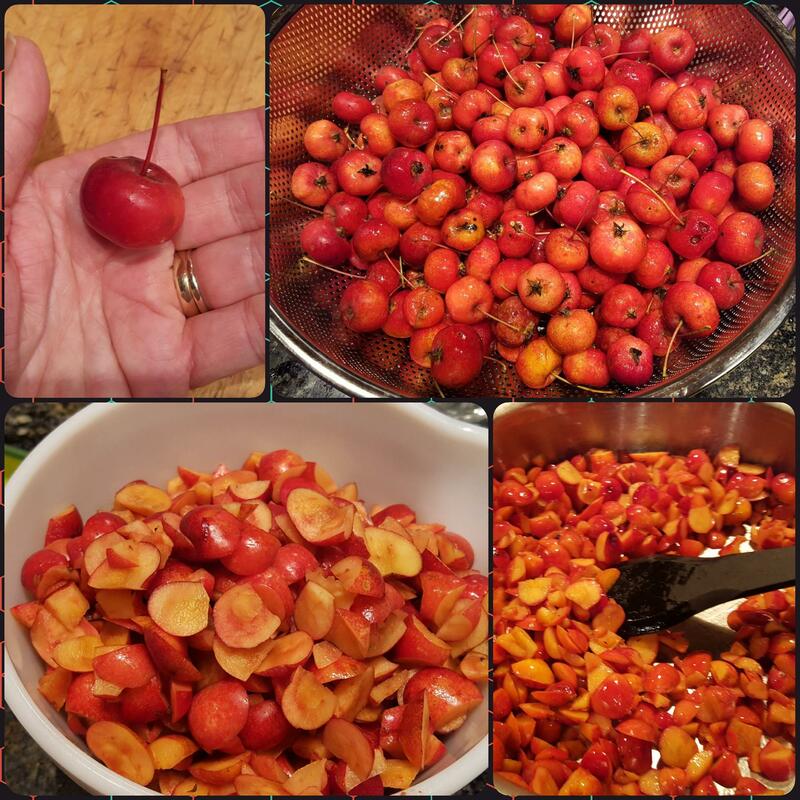 Thanks to members uptopic who recommended crabapple jelly! 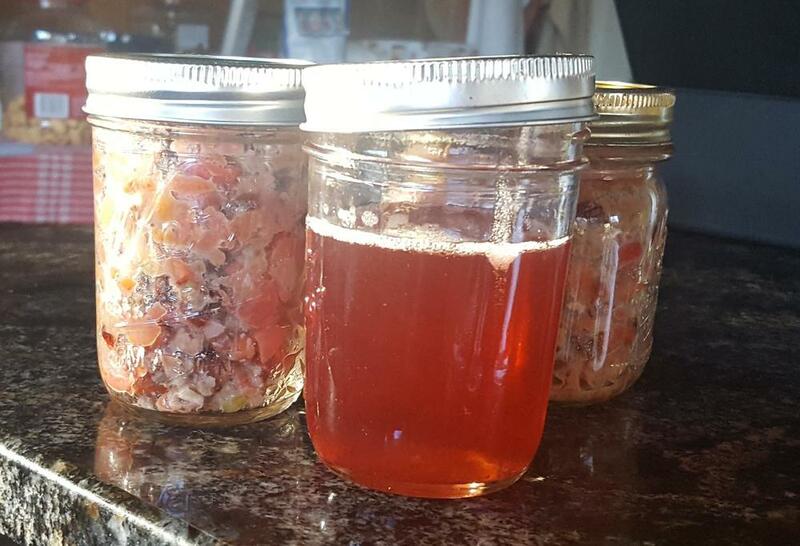 I had misgivings about that idea, given my general tendency to forget jelly in the pantry for years, but went ahead and tried a small batch using this recipe: Classic Crab Apple Jelly, from seasonsandsuppers.ca. I was more inclined to think I'd want chutney, so more of the apples went into a loose riff on Crab Apple Chutney from The Heirloom Gardener. The jelly is wonderfully tart, not too sweet, and has the gorgeous color promised. The chutney may need a bit of heat added, according to my darling, but we can do that at the table. There remains enough chopped apples and pecans to make some nice small pie fillings if I get to them. I may just eat that for breakfast instead. Thanks for the suggestions, folks. The traditional use for excess (or stolen) crabapples is to throw them at cars and run away. @Smithy We used to have a crabapple tree in the yard in Colorado--I swear mom made jelly once.....I remember liking the tartness---but maybe I'm delusional and I tasted it somewhere else. I'll have to ask her. Either way, that is a gorgeous color and I know it was a lot of work, but you guys will certainly enjoy it! I finally made @HungryChris's marinated mushrooms. I should have bought more, but this is a start. Also, I couldn't find dill weed in my spice cabinet (it's probably there, but I didn't have the strength to dig any more lol) so I used dill seed. Cannot wait to try in a few days. And, thanks Chris! At one point in my youth there were a couple crabapple trees in the yard...I was told they were poisonous. The jelly wasn't as much work as the chutney! I quartered, seeded and chopped those teensy crabapples for the chutney. The jelly recipe says simply to cut off the blossom end and remove the stem at the other end, but to leave the seeds and core. The whole mess gets simmered for some time, then strained to get that lovely pink juice. The instructions emphasize NOT to squeeze the jelly bag because the juice and resulting jelly will be cloudy as a result. I've been scoping out the crabapple trees up and down our road. There are only two worth harvesting; the other couple dozen have either poor flavor or poor texture. Perhaps the texture wouldn't matter for jelly-making purposes. Maybe I'll find that out in a year or two when the trees bear fruit again. I absolutely, positively need to do HungryChris' marinated mushrooms, and I keep forgetting! Thanks for that reminder again. I should have time in a few weeks. If it's as delightful as I'm expecting, I'll make up some batches as Christmas presents. I've been scoping out the crabapple trees up and down our road. There are only two worth harvesting; the other couple dozen have either poor flavor or poor texture. Perhaps the texture wouldn't matter for jelly-making purposes. Maybe I'll find that out in a year or two when the trees bare fruit again. Excellent idea about the Christmas presents..... could probably can them? Process for about 15 for quarts? I'll have to research. Other than the purchased pickled ones I mentioned up-topic, my only crabapple experience is careaking a line of 20 young ones for the botanic garden. They were destined to be espaliered in the "rare fruit orchard" but the plan got delayed due to manpower issues. So...they fruited even in less than ideal sunlight - tough guys. I picked some for myself and a friend to taste. I loved the tartness and flavor raw. My friend reminisced about his mom's jelly. I think they would be good thinly sliced in a salad. In fact, the salad idea is a good one. Maybe that's what I'll do with the remainder. Both flattered and honored, Shelby! 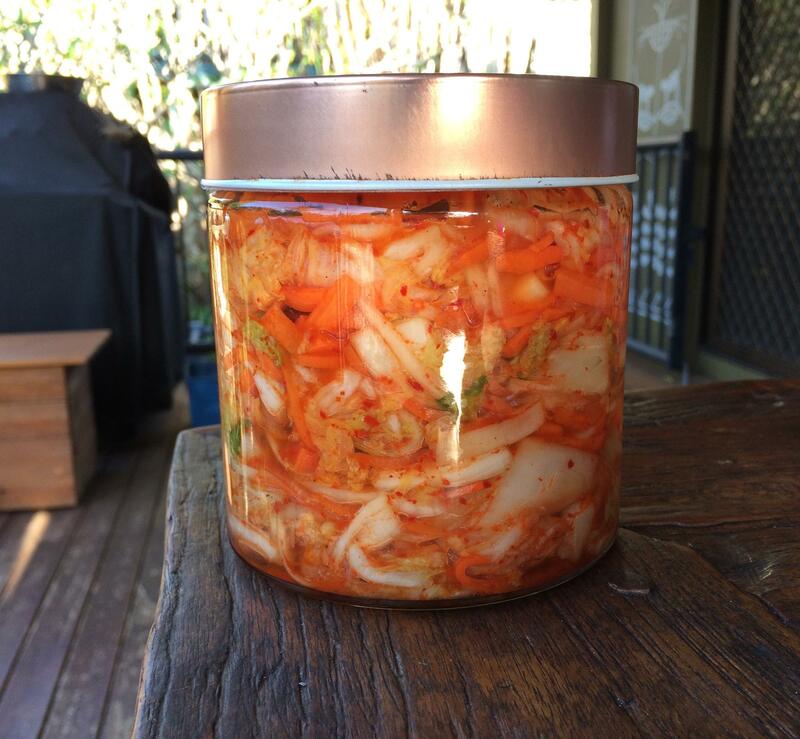 I found this thread again, and was inspired to try my first ever Kimchi. Here it is with wombok (Napa cabbage) daikon, carrot and spring onions. It’s about 24 hours old, and producing bubbles ! I’m excited!